If you’re looking to make something with rice and are short on time, try one of these superquick recipes that take 30 minutes or less. In this week’s episode of Mad Genius Tips, F&W’s Justin Chapple demonstrates how to make crispy rice crackers out of leftover rice. It’s a superuseful trick, but it does take some time. If you’re looking to make something with rice and are short on time, try one of these superquick recipes that take 30 minutes or less. 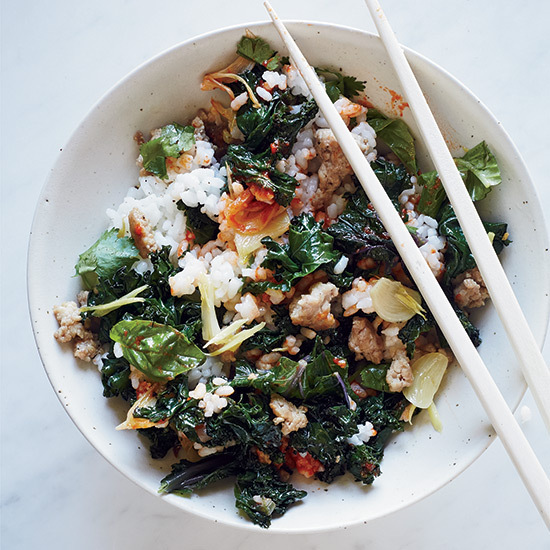 In this simple rice bowl, F&W’s Kay Chun combines pork and kale with an abundance of fresh herbs for a dish that’s both hearty and delightfully fresh-tasting. A quick thyme-scented butterscotch sauce made with butter, brown sugar and Scotch adds a terrific flavor boost to rice pudding. Quick-cooking Bomba rice has a distinctive chewiness that’s perfect in recipes like this outrageously crusty and very fast seafood paella. This speedy pork fried rice was chef Takashi Yahihashi’s favorite childhood after-school snack. For an elegant version of everday rice and beans, start with basmati rice, then cook it with wonderfully aromatic flavorings like onions, garlic and cumin. This flavor-packed recipe takes just ten minutes to make. Using good sausage is an excellent time-saver because the links are already spiced and seasoned.